I almost gave this 0 stars. For only $18, I was willing to take a chance. I needed to get my VHS Archives online before it was too late and the tapes were degraded all to hell. Fortunately the tapes are in great shape, so all I needed was a way to convert them. I didn’t even know if my VCR was still working. It’s not so easy to hook up an old VHS player to a hi-def system anymore. 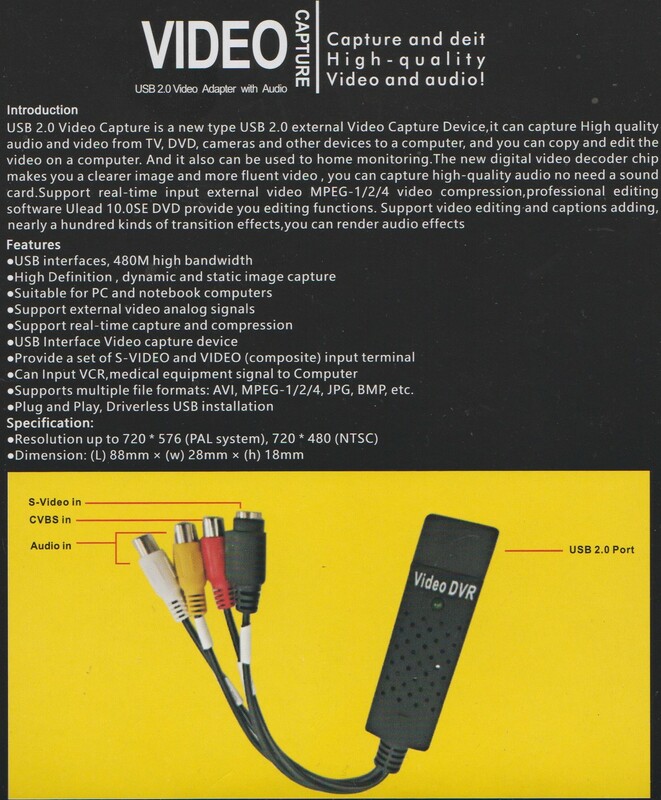 So I gambled my $18 for a little USB device to connect my VCR to a PC, using a USB-to-RCA device and some special software. I set up a little work station with my VCR and laptop and began running into problems. Issue #1 is no big deal for me, but might be for you. The software you need can’t be downloaded, it’s on a little 3″ CD included, with a 16 digit access code printed on it. My laptop refused to install the software — something to do with permissions and security. The manual isn’t super-helpful. “Any problems, please email the seller,” it says. I’m sure some lackey at Amazon could tell me how to install it…. I bypassed the error by installing the software in a different folder. Then I hooked up the VCR to the USB device and plugged everything in. Unfortunately I could not get the software to detect the video source. It defaults to capture from a webcam, but it couldn’t access the USB. “The selected device cannot be used” said the popup window. “If you get this error message, the USB might not install correctly. Input win+x or use other ways to open the device manager”. That was the not-helpful advice in the manual. However it did tell me that the USB needed to install something on the laptop, and that was the hold up. I was unable to get the USB to install, so I decided to try a different computer. I tore down my little work station and hauled the VCR over to my desktop. Everything installed quickly and easily on my PC. In the end all I lost was an hour of my time, and my plan to use my laptop for everything. No big deal. I can manage. So how does this device work? Once you have it running, it works like a charm! It’s the easiest thing in the world to use. Rather than burn my tapes to DVD, I set the device to export directly to .WMV video file. Click “record” on the software, press “play” on your VCR, and you are in business. As soon as you click “stop”, the file will save itself. You can make a file up to 24 hours long! Any tape you have, this baby can handle it. There is also an editing suite here to trim the excess or add transitions, but I don’t use it. It is very limited. You may as well use the default video editor on your computer (Window Movie Maker on mine). Within minutes of playing my tape, I had videos on Youtube. So painless! The quality you get will depend entirely on your tapes and VCR. Fortunately those things were not an issue for me. You’ll probably have a harder time finding a VCR that isn’t all beat up, than using this device. Incidentally you can plug in anything that uses standard RCA plugs or an S-video connector. Bumpy installation aside, the Video Capture USB 2.0 has done everything I needed it to do, and actually more smoothly than I thought it would be. For the price, this device is recommended — but be forewarned you may have the same problems installing it as I did. I’m glad you got it working okay, Mike. A pernickety wee thing, eh? I believe it’s a similar wee doofer that my pal used to salvage the ‘Sleepytapes’; though they weren’t in the best condition (certainly nowhere near the quality of those you’ve been posting). Definitely persnickety, and with terrible instructions to boot. I was afraid I’d have to start digging through message boards to get it to work. However my PC handled it and now it’s just a matter of playing the tapes and recording them in real time! Nothing more frustrating than trawling message boards. Or asking the question too, some people are…less than helpful. For 18 bucks I didn’t want to sink too effort into getting it to work. Aye, there are always some who aren’t too interested in being helpful. Yeah and I’m not a computer guy, I can figure minor things out, but I don’t know my way around Windows. If I spend enough time I can usually figure my way around, but it can be a pain. People usually help me. They start by asking “What version of Windows are you running?” And I’m like “I dunno, how can I tell?” And that’s how much walkthrough I need! The videos have seen so far have been great. I am still way behind as you have posted so many. Looking forward to tackling more this weekend. Well don’t feel pressure to watch everything. You’ll wanna see Kiss for sure, but I have a lot going up. You’re inspiring me to get my act together and do the same. I have a bunch of stuff somewhere, just not as far back as yours. I’m pretty sure I have the Black Keys first TV appearance on Conan. Someone already uploaded it onto YouTube but mine is much better quality. The Black Keys were on TV in the VHS era? Yeah the Vigilant video — my copy is far better than the one that was on Youtube before. It’s longer and clearer. So by all means, upload away! Uhhhh…. I may have recorded it at work… with some equipment that is little better than VHS…. And I have no idea what is better than VHS so you got me there. Digital tape? Yeah, they’re on some broadcast quality digital beta tape. I may have dubbed them onto DVD already though. I’d have to check. Digital quality beta. You learn something new every day! Yeah, beta lost the battle in the home market but dominated the commercial side until video became something you stored on a harddrive. And you were able to get close to digital quality on analog recorders? Nah not me. But, I don’t know if this is Mac compatible. Of course I’m sure there’s a similar device for Macs! Well that’s it for me commenting tonight. I took the day off tomorrow to take Jen to the doc, so I’m gonna go back now and go through more tapes!